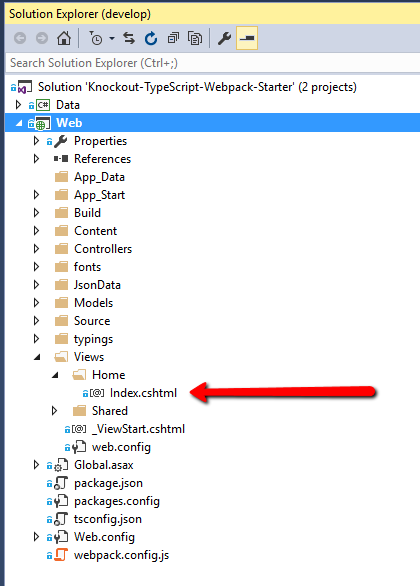 Are you considering using KnockoutJS with TypeScript and Webpack for a single page application in an ASP.NET MVC context? Then this starter project is for you. Recently I worked on a relatively complex single page app with KnockoutJS and TypeScript. The result of what I’ve learned during this project is incorporated in this MVC-Knockout-TypeScript-Webpack starter project. The aim is to provide a quick start for anyone using the same technology stack. The focus is very much on the use of Knockout components. A structure is provided for building up a single page application out of Knockout components. This includes a structure for setting up form steps, which are also implemented as Knockout components. 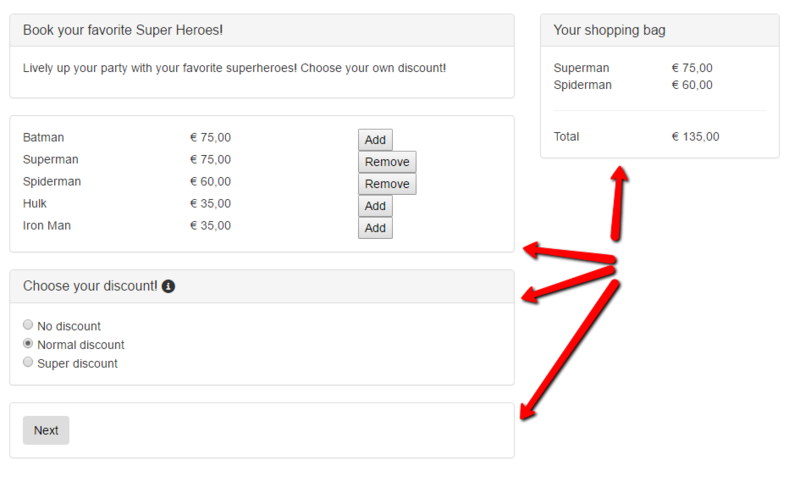 By way of example, the starter project includes a few form steps, as well some components used in the various form steps, such as a list of superheroes, a shopping bag and a discount selector. The elements in the screenshot indicated by the red arrows are separate Knockout components. I have a back-end programming background myself. After doing some work recently with Angular 2 and TypeScript, I was really enthusiastic about TypeScript, because of the similarities with programming in C#, including strong typing and the object-oriented structure. So TypeScript seemed a logical choice for the project. KnockoutJS was chosen because of the good compatibility with older browsers. Because we will be working with TypeScript 2.0 make sure you have TypeScript 2.0 installed in Visual Studio, through Tools > Extensions and updates.If you are using Visual Studio 2017, the default version is TypeScript 2.3. In that case, first install TypeScript 2.0 through Tools > Get Tools and Features, and do not upgrade the project to TypeScript 2.3 when asked, when you load the project for the first time. The project needs Node.js, TypeScript, Webpack and Knockout JS. If you build the project in Visual Studio you should now be able to start the application with Ctrl-F5. This tool enables you to select an element in the page through the Chrome developer tools, and view the properties and values of the related Knockout elements, if any. I won’t attempt to provide an exhaustive description of the project, but some highlight and main features are presented. The files can be added to your project through Nuget, GitHub (https://github.com/DefinitelyTyped/DefinitelyTyped ) or the node package manager. In the starter project a directory with type definition files for some important libraries is included under the root. Type definition files for Knockout, Require and jQuery are included. at the top of the TypeScript files which require Knockout. The project is set up as a Visual Studio solution, consisting of two projects, Web and Data. Web contains the web application as well as the single-page application. Data is a class library project containing some additional models and helper classes for data provision. The original project from which this starter project is derived is an ASP.NET MVC application with a commercial CMS system. In this project, we’ve kept things simple, we just have one MVC controller and view to host the single page application. In your real-world application this could be any kind of web page. We have some basic ASP.NET MVC ingredients: a HomeController, a corresponding MVC view (index.cshtml), and a _Layout.cshtml. Views > Home > Index.cshtml contains the starting point of our single page application. 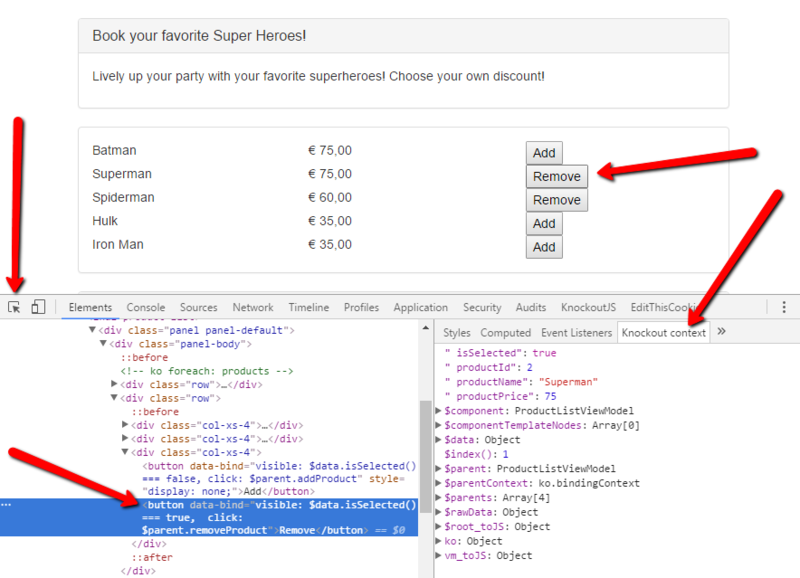 The directory App/Components contains the application-specific components such as the list of superheroes and the discount selector. The directory App/FormFields contains more generic components, such as components wrapping input fields and label components. The directory App/Services contains classes which take care of obtaining data from the MVC backend through calls to api controllers. This will generate the file app.bundle.js and vendor.js in the Build folder. If you want to stop the watch process, type Ctrl-C in the command window. Configuration of Webpack is done through the webpack.config.js file in the root of the Web project. The starting point is a component called MainForm. This is the only component which is directly referred to in the Razor view “~/Views/Home/Index.cshtml”. This component hosts all other components, directly or indirectly, as components may also host other components. MainForm is mainly a container for the other components, in which the actual work will be done. Every component consists of a viewmodel and an html template. In this project, the viewmodel and template of every component are kept together in a single directory. 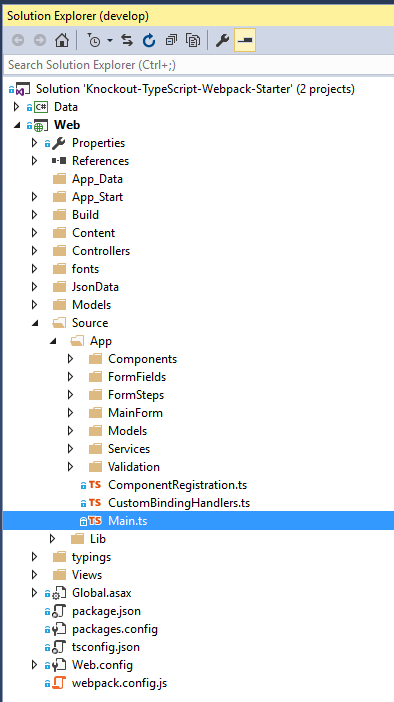 To facilitate the creation of a new components, the folder \Source\App\Components\Template\contains a component template. You can copy this folder, replace the word “template” by your component name, in the file and folder names as well as in the names of the classes, and register the component. To be able to use a Knockout component, the component has to be registered first. Because the number of components in a large single page application may be substantial, a separate file is used for component registration, ComponentRegistration.ts. The form steps are also implemented as components, so they are also registered in this file. Nothing is happening in the viewmodel class MainFormViewModel in this particular instance, but generally this is where all the work is done. This structure, in which a separate component class to set up the component in the constructor, is used for all Knockout components in the project. This is done so the html template and the viewmodel can be kept together in a single folder, with relative paths. load the data needed for the application (heroes, prices) by calling the appropriate methods in the service classes. bind the main Knockout viewmodel. To gain access to the data which the application needs (labels texts, products, prices) the single-page application includes some service classes, which generally make a call to a web api controller supplying the data, and store the data in a static variable on the class. These classes may also contain some business logic which must be globally available. Because the data must be loaded before the components can be shown on the page, and because there may be dependencies between the various services, promisesare used when calling the methods in the service classes which are responsible for loading the data. These methods are called from Main.ts, in the appropriate order. For instance PriceService.tstakes care of getting the prices from the backend, stores the prices in a static variable priceList, and contains a helper function to select other prices when a different discount level is chosen. The starter application provides basic plumbing for multiple form steps and navigation through those form steps. The app consists of four example form steps: product selection, entering personal details, a “check and submit” step, and a “thank you” step. The form steps are also implemented as Knockout components, inheriting from a FormStepBase component. Remove them and add your own form steps as needed. Add a subfolder to the /Source/App/FormSteps/ folder with the name of your form step. Add the viewmodel and template files. Add your form step to MainFormView.html, as a nested component, and assign an order value to the form step. Every form step viewmodel has two properties with which the visibility of the form step can be manipulated, active and visible. These properties are inherited from FormStepBase. To disable a form step due to some business rule, you can set active to false, and the form step will never be shown. Because validation usually happens when moving to the next form step, a validation model needs to be set up for each form step. This model is instantiated in FormStepBase. Every nested component which has to be validated needs a reference to this validation model, so form field components such as the text field and textarea components (in the folder\Source\App\FormFields\) inherit from a base class FieldBase, which sets up the reference to the validation model of the current form step. Hopefully this starter application will give you a head start with your application. If you have any questions or suggestions, please let me know. Thanks to Guido de Ram who did much of the work on Webpack and Knockout Validation in the original project from which this starter application is derived.